Clooney, Clooney, Clooney, *sigh* the man can do very little wrong round these parts. 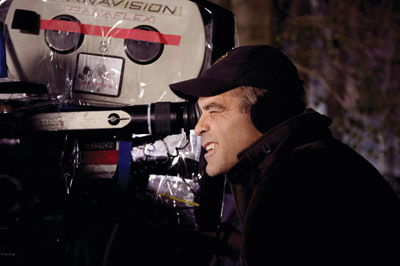 The Champion of the Late Career Bloom, the Throwback to Old Hollywood Charm, the Purveyor of Effortless Cool, and He Who Ain’t Hard on the Retinas; we look on all things George Clooney with an indulgent eye. Sadly, the depths of our adoration were tested with the lacking, unspectacular Leatherheads. It is 1925 and the sports universe is still in an amorphous flux. Professional American football doesn’t look very much like what is currently viewed on Sunday television. Teams share their fields with nervous-looking livestock and are more brawlers than sportsmen, setting elaborate plans not for plays, but for cheating strategies. The sheer messiness of the game isn’t catching on with the general public and forces the collapse of teams like dominos across the country. One of the teams on the verge of disbanding is the Duluth Bulldogs, until their wily, ageing captain, ‘Dodge’ Connelly, sets his sights on Carter Rutherford, All-American war hero from the more popular college league and lures him into playing for the motley Minnesota crew. All may not be as wholesome and clean-cut as things appear with young Carter and a tip from a disgruntled fellow soldier sets the ambitious Lexie Littleton, girl reporter for the Chicago Tribune to Mata Hari some secrets out of the naïve Princeton man, following the team from game to game across the Midwest. A triangle of sorts begins between Carter, Lexie and Dodge, but Lexie’s true purpose for being there threatens both Carter’s reputation and the entire Duluth Bulldogs team. Here is Clooney’s attempt at a 1930’s screwball comedy, those breezy, romantic pictures punctuated with clever, syncopated patter and occasional slapstick, such as It Happened One Night, The Awful Truth or My Man Godfrey. 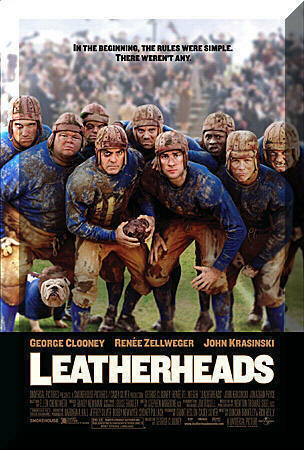 However, where Leatherheads goes wrong is splitting the focus unsuccessfully between the bittersweetly funny Duluth Bulldogs’ struggle to survive and the leaden love triangle. Rarely have I seen a cinematic romance as deathly uninteresting as the one shared by the three leads. The entire film stops cold as soon as the lovey dovey stinks up the air, and I have to put a lot of the blame for that on the surprisingly weak portrayal of Lexie by Renée Zellweger. In oddly period-inaccurate wardrobe and hair, Zellweger snores her way through a role that Rosalind Russell or Barbara Stanwyck could have mastered in their sleep. She may as well have been reading her laundry list for the involvement and spark she gives Lexie’s lines. For all that she was the only female within constant reach of the football team; I didn’t once believe that either of her suitors would compete for her drab affections. This could’ve been a great role for some actress, but it wasn’t this one. It was perplexing because her performances in Chicago, Nurse Betty and the Bridget Jones films bear out Zellweger’s talent for comedy. 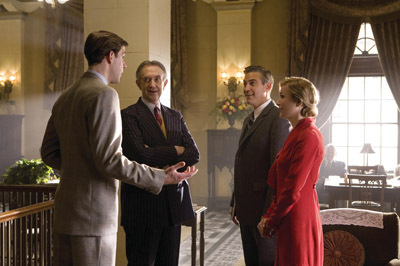 As the film’s director, surely Clooney should have been attuned to the discordant performance and helped a sister out. 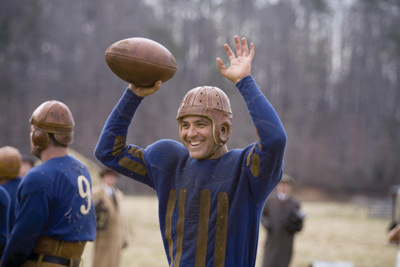 He would have done far better to keep his eye trained onto the raucous, rambunctious beginnings of pro football, which are nearly the only laughs to be had. John Krasinski, on the other hand, nails the football star/alleged war hero with a secret. He gives himself over to the delivery and affects of the time period without seeming kitschy or self-conscious. His open face and manner captures the good-natured self-absorption of a young man who’s learned quickly to live with sudden celebrity and his bewilderment when it’s all about to collapse. Jonathan Pryce is supremely oily as Carter’s avaricious manager, always on the lookout for new and better ways to exploit his client. His innovations on behalf of Carter drag professional football into the tantalizingly glitzy first forms of the advertising juggernaut it will eventually become. 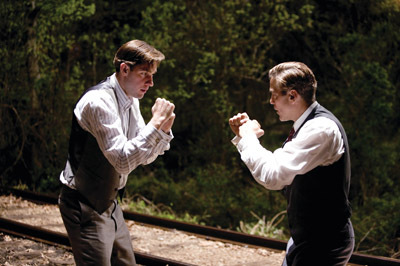 Clooney himself does almost no stretching at all as Dodge, and while that’s fine here - his natural charisma, a cross between Clark Gable and Cary Grant, suits Dodge’s puckish charms - I don’t know how many variations on his own persona we’re going to see before even I get tired. 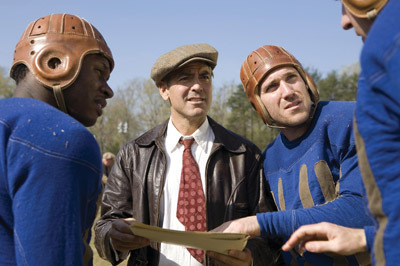 Leatherheads is George Clooney’s first directorial epic since 2005’s excellent Good Night and Good Luck. 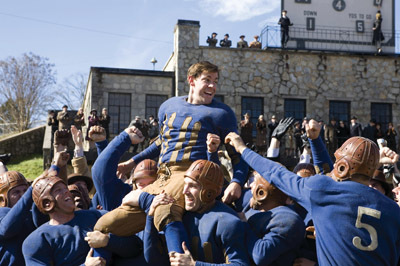 While not a total loss by any stretch – Leatherheads is simply a film that wasn’t sure what it wanted to be and hedged its bets too long while deciding.